One of the most easily-recognizable features of the Amish is their Plain clothing. Amish women are distinguished by long, solid-colored dresses and head-coverings, and men by beards and suspenders. In “Why Do They Dress That Way?” Stephen Scott writes that “Dress speaks…One group of people’s dress utters volumes about them though they are otherwise quiet and unobtrusive.” What are the Amish saying by their choice of characteristically simple clothing? In contrast to modern fashions, Amish clothing reveals little. Non-Amish may see dark, long-sleeved clothing as uncomfortable. Yet Amish feel that wearing revealing clothing is un-Christian. Amish feel that exposing the body to view can promote sinful thoughts and behaviors. They feel that Christians should stay covered up as a way of honoring the bodies which they have been given by God. Amish cite numerous Biblical verses for their adherence to Plain clothing, including from the Gospels, Thessalonians, Corinthians, Romans, and Timothy. Key verses include I Timothy 2:2, 10 (“In like manner also that women adorn themselves in modest apparel, with shamefacedness and sobriety; not with braided hair, or gold, or pearls, or costly array, but (which becometh women professing godliness) with good works”) as well as I Peter 3:3, 4 (“…let it not be that outward adorning of plaiting the hair, and of wearing of gold or of putting on of apparel, but let it be the hidden man of the heart, and quiet spirit, which is in the sight of God of great price”). Amish interpret some of those Biblical mandates to plain dress differently. Amish women cover their heads as admonished in Scripture. Some Amish men do not trim their beards, for example, citing Leviticus 19:27, “neither shalt thou mar the corners of the beard.” Others, however, do maintain short, cropped beards. The general idea of Plain clothing is accepted by all Old Order Amish as based in Scripture, though its individual manifestations may differ. Another part of the appeal of Plain clothing is its simplicity and practicality. Wearing simple clothes reduces the choices that need to be made on a daily basis. Unadorned clothing in solid colors is simpler to make and maintain. While some may see this as removing the spice from life, Amish appreciate the simplicity. 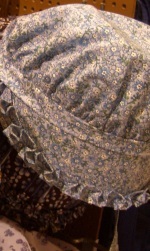 At the same time, small distinctions may be made, as some Amish may choose finer or more attractive fabrics. The Amish feel that as Christians they are bound to be “in the world, but not of the world.” Worldly clothing is symbolic of worldly ways. Amish are taught not to love the world, but God’s spiritual kingdom. The choice of plain clothing marks the Amish choice to reject the world. By its nature, plain clothing helps promote Christian ideals. Amish live in countercultural communities as they feel that they are the best means of manifesting Christ’s teachings. Plain clothing discourages status-seeking through the practice of acquiring and wearing fine clothing. It diminishes competition and underlines the importance of community over the individual. It discourages emotions such as envy and jealousy, though Amish recognize that it is impossible to eliminate these from human nature. Plain clothes clearly distinguish the Amish as a people apart. Amish plain clothing is distinct, not only in comparison with non-Amish clothing, but when compared with other plain groups such as Old Order Mennonites. Clothing also varies among Amish groups. An Amish person is often able to discern an individual’s community from their style of dress. Thus, plain clothing is an important marker of Amish identity. Some make the point that nowhere in the Bible are there admonitions to wear suspenders or solid-colored dresses. Amish plain clothing evolved over time as a result of a number of factors. Items of plain clothing became accepted, and were often chosen in reaction to what was seen as popular at the time. Thus, the plain clothing of today came about over time, and is a result of Amish response to influences from the dominant culture, as well as by Amish following Christian beliefs of modesty and humility. Old Order Mennonite dresses may have patterns and checks, and Mennonite men may wear jeans, overalls, and plaid shirts. The prayer covering is common for women as well. Hutterites also wear plain dress, with certain groups of Hutterite women wearing a distinctive polka-dot pattern. 62 responses to Why do the Amish wear Plain clothing? Why do the women all use straight pens instead of buttons. The amish women use straight pins to hold their clothes because buttons are considered decorative. They want nothing on them to draw attention to their way of dress. Little girls’ dresses fasten with buttons. My wife & daughters’ dresses have snaps but use pins for the cape & apron that are worn for formal occasions. What is meant by “cape dress” for the women? the cape portion of many plain/conservative Mennonite groups dresses, goes back again to being modest. There is a second layer from shoulder to waist, & attatched at the waist. This is to hide undergarment lines, & disguise the bustline. Why do Amish women only wear blue, black and green dresses? I see the younger women and children wear rose and print. Is that correct and why? Why can’t they use snaps or buttons? Why do they wear long aprons over there dress? Why do they cover there heads? I might be able to answer a couple of these questions although I am not Amish. First in regards to pins rather than buttons or snaps. There is a huge variety of buttons and snaps,,, some we would consider rather plain while others can be quite fancy. To allow their use would then open the door for a competitive nature to arise in “seeing how dressy or fancy” they can get the buttons or snaps. That in turn would or could cause emotions like envy and jealousy which the Amish avoid. They avoid it because that is what can break down a community and also cause sin. As in, “thou shalt not covet”. A cape dress is a dress that has a cape sewn or sometimes tied around the neck line at the shoulders and hangs down over the top of the dress. I see cape dresses more on non-Amish such as Baptist Brethren, who also dress “plain” or “modestly”. The color of the clothes they wear is usually determined by their particular community. Some communities may only allow 2 colors or 3. Again, this eliminates any competition and promotes unity. Typically, printed materials are only used by non-Amish, such as Baptist Brethren, some Mennonites and the like. I am not 100% sure about the aprons but I believe the apron is a symbol of servitude or “having a servants heart”. It is also practical as it keeps the dress cleaner. Head-coverings is biblical. In 1 Corrinthians 11: 1-16 women are admonished to cover their heads. (wear head coverings). By wearing the covering a woman is honoring her husband. While some will argue that it says that is while they are praying or prophesing there is other scripture that says we are to “pray ceaselessly” meaning to be in constant prayer. So, a head covering should be worn all the time. God’s order of command so to speak, the husband is the head of the wife,,, Christ is the head of the husband,,, and God is the head of Christ. So you might think, “well if she is single why does she have to wear a covering.” In the case of the single woman, her father if she is still living at home, is her head. If she is living alone,,, her head would then be Christ and she must cover to honor him as well. There is more to it but that is the basics. Hope it makes sense and I did not get too wordy. I read your comment to my questions and that explains a lot. Marilyn, so glad I could help!! You are most welcome. Hi, I am wondering if anyone on this site could write an article or email directions on how to make an Amish dress?? I did some ‘googling’ and I found an article on how to make a plain dress with many pictures but it isn’t amish-style and it isn’t very through. All you need to do is look up/google modest christian clothing or cape dress, & you will find options. The King’s Daughter’s, & Lilies of the Field have options. I live part of the year in Lancaster and part in Texas. I have a very dear Amish friend who taught me how to make Amish dresses. There is a big market in modest dresses and so I am busy making and selling them. If anyone is interested they can let you know, Erik, and then you can email me. I just recently sewed 2 Amish dresses for myself. I can’t imagine trying to describe that over the internet let alone doing it without a pattern 🙂 It would be *very* hard! There are websites to buy patterns or clothes though. King’s Daughters are good patterns to buy for plain clothing. I think you could use snapguide.com to create a visual guide to making an Amish dress. Another option for plain clothes is through Gehman’s Country Fabrics of Lebanon, PA. They have patterns from King’s Daughters and Home-Sew Design. Their women’s cape dresses and girl’s clothing may be more in the Mennonite style, with zippers. Although most Friends are hard to distinguish by looks, a few are Plain. It’s mostly the Conservative branch that has members that dress Plain but I believe there are a few even in the very liberal (so liberal that there are Atheist Quakers amongst them) FGC. Quaker Jane has a good site about Plain Friends. By the way, do the Amish speak Plain? Even amongst those who dress less conservatively, they use Plain speech. Thee, and no week names or month names, no titles, things like that. No, Ann, Amish do not “speak Plain.” They use the calendar names of the days and months. Although I’m not too familiar with it, the Quaker Friends’ plain speech or simplicity in speech, may refer to their Testimony of Simplicity. Many Amish school teachers do not use a title; they just use their first name. But it could vary. One belief shared by the Friends and the Amish is to affirm to tell the truth in court, rather than swearing an oath. “Swear not,….but let your yea be yea; and your nay, nay;…” James 5:12. They are often for sale on eBay (varying degrees of authenticity). Some are outright Amish, some less plain (more Mennonite). Candle on the Hill has lots of good sewing patterns, and they also explain the different styles appropriate for Amish, Mennonite, Quaker and other plain clothes wearers. You can buy sewing patterns or just brouse at candleonthehill.com. You can also buy a treadle sewing machine from lehmans.com if you live off-grid. Why do men’s pants not have back pockets? Dee, I’m not sure why, but the shirts do not have pockets, either. Maybe to make it unhandy to carry cigarettes? I suspect that the reason for wearing long aprons is that Amish women WORK. An apron is a hand towel, an oven mitt, and a basket to carry as well as protection for the front of one’s dress in case of minor spills. Aprons are easier to make and repair than dresses, and easy to change when soiled. If those plain gowns are wool (I have no idea, but it would be MY chosen fiber for daily wear) it would certainly make sense to wear a cotton apron, which can be bleached, to avoid having to wash the dress. My family was Old Order Amish until i was three years old. My aunt recently showed me some photo’s of my mom and another aunt from the late 1970`s. The dresses are much different than the dresses my Amish relations wear today. They are more form fitted, look like “a line” style dresses to me, and end just above the knee. I haven’t been able to find any photo’s online of similar styles. This was in indiana if that helps. Does anyone know if those dresses were common? I forgot to mention that there were photo’s of them in church dresses that were the traditional mid calf length. Although the photo was blurry and they were wearing aprons so i couldn’t tell if they were the same a line form fitting style of the other dresses. My grandpa was a minister so I assume the dresses were church sanctioned. I’ve seen a documentary about Amish and an Amish woman said that they put aprons as an extra protection from revealing the shape of the body. I came across a website that had various styles of dresses such as German Brethren,Mennonite,Amish,etc.called either Plainly Simple or Simply plain I can’t remember which.I think it also had kapps and underclothes,too.They were all in various sizes for babies,women,and girls.It even had things for men to wear.If any of this helps you that’ll be great and I really hope it does!Good Luck! I’ve noticed that in summer at least the majority of Amish children, boys and girls, go barefoot and that adult women are also often barefoot though maybe not as much as the kids. Yet adult men always seem to be in shoes at least in public. The kids even go to school barefoot, so it’s obviously very common. I was wondering if there is a biblical reason for this, or is it a specific rule like wearing hats or aprons. Is there a reason adult men don’t do this? Does it show that the children and wife are below the men? Obviously it isn’t a poverty thing and the kids and women have good shoes, but they choose not to wear them and in such high numbers that I assume it has to be at least strongly encouraged if not a specific rule. Anyone know if that’s the case? This is a good explanation by Forest. Many Amish people like going barefoot. I have seen at least one Amish farmer milking with no shoes on. I’ve never seen my Amish cousins and uncles going barefoot. On vacation this year my uncles wore white socks and “crocs”. I don’t think i’ve seen an adult Amish man barefoot outside or in flip flops like my female relatives used to wear. In warmer weather, the majority of them wear crocs (with no socks or with black socks) or go barefoot. Oops! I meant male cousins in that first line. I asked Mark about this. He said that when warmer weather comes just about all the women and children in his community go barefoot. Not so much the men and boys while they are working in shops or out on the farm. But, in the evenings, the men kick off their shoes, too. It is acceptable for little children to come to church barefoot. The Amish are practical and it saves on shoe leather plus it’s cooler. Mark wears crocks during the summer and especially working in the garden. I have Amish boys and girls who mow my grass and it just about terrifies me to see them out mowing the grass with no shoes on. Don, you reminded me about something I haven’t thought of for years. My grandpa used to cut the grass — first with a reel mower then with a gas mower — without shoes on. That really didn’t make my grandma very happy! My dad occasionally did the same — which didn’t make my mom so happy, either! I wish I knew what happened to my grandparents’ reel mower. At some point, I want to buy one — but I will definitely be wearing shoes. The fumes from gasoline-powered lawnmowers make me sick, so it’d be nice to have a mower I could actually use without passing out! I wonder if this rumor I’ve heard is true: in most Amish families, the women and girls cut the grass, while in English families, it tends to be the men and boys who do so. I wonder if it’s true, and if so, why that would be. That’s a good point, about being cooler. When Amish people wear long dresses and slacks, especially with an apron and cape for the women, any bit of relief from the heat seems like it’d be nice! In one of Linda Byler’s books, I forget which but was in her “Lizzie Looks for Love” series ( Linda being Old Order Amish even now ), she mentioned that the women of her district at that time wore, even during the hottest months, six layers of cloth ( on Sundays, anyway! ). These were: the dress itself, made of 2 layers ( the visible layer and the facing — the layer lining the inside of the dress ), a cape ( visible layer and facing ), and an apron ( visible layer and facing ). The way she presents this in the book, being spoken by the character I think may be be semi-autobiographical, is quite funny. But thinking about that, I’d bet being able to not wear stockings and shoes would be a welcome relief! My mom did yard work for relatives. When I was growing up my mom would be pushing a mower(gas)for hours doing work for relatives.She once worked for at least five hours on a relative’s yard with only a weed eater,no mower,including a steep bank to do.Now that I’m grown up I go around barefooted all the time at the house.I find it much more comfortable even more so in the warmer weather of spring and summer,with the odd weather we’ve been having the past couple of years,sometimes even the winter,too.Although having a husband,for the past almost 5 years,to do the yard work for me has made it to were I wouldn’t get near a mower or anything like it if you paid me to!I never had to get around anything that dangerous when I was growing up.I would have to sweep snow off of the neighbor’s porch,pick up sticks/branches in the yard,and rake leaves but nothing were I could hurt myself.I hated doing it back then ,due to a car accident I was in at age 15 or 16 where I injured my lower back permanently,but now realize that it was all a part of helping out the family/neighbors who couldn’t do it.It was good for me to do and I still do as much as I can when that injury doesn’t want to act up. I just left an Amish auction. It is common to see different styles in suspenders, and it is somewhat common to see a few without suspenders. However, I saw a couple today who wore a one-shoulder style of suspenders. Can anyone tell me more about the reasoning behind this? That would actually make an interesting subject for Erik to blog about. It is a curious thing, isn’t it? Of course I suspect it has something to do with the order, strictness and which community the person belongs to that determines the style worn, or not worn. Once again, I think Erik should do an article on this “fashion statement” of the Amish. Great idea Shom…Stephanie I have never investigated the reasoning behind this, but if I did I don’t know how much I’d find by way of explanation. The one suspender is seen among the Byler Amish in the Big Valley area of PA.
Like some other customs of Amish life sometimes the reasoning may have more to do with historical accident or one group distinguishing itself from another than with any thought-out rationale. Recently while reading a Beverly Lewis novel, she mentioned that the women used 27 pins to close their dresses…not one more or one less. What is the reason for a specific number? Yet another incorrect “fact” from Beverly Lewis. My wife’s cape & apron has 8 pins in it, but there is no rule — some use more, some use less. I have often wished Mrs. Lewis would do some accurate research, but her fiction is probably more entertaining than fact. It appears that the Amish dress ‘plain’ because it gives a sense of community and identity. Where I live, there are no Amish or Mennonites (I’m in the UK). There is nothing I would like more than to be Amish (yes, I can do without electricity and modern conveniences). However, if I dress ‘plain’, I would not be identifying with anyone and would stand out so much as being the only one who dresses that way in my community and church. Can I still dress ‘plain’ anyway? What effect will it have on my church (Brethren) and my community? I live in the UK and am exploring the possibility of Amish (or similar) dress because I see it as a witness to the young Muslim women in our towns and cities who emphasise modest dress, and to any hurting teenagers who might be drawn to Islam because they seek order, integrity and faithfulness, and think that they have exhausted the Christian faith when actually they have never tried it (I was really grieved by that part of Samantha Lewthwaite’s biography). Whilst not setting out to be noticed (or at least, not as “me”, rather as what I stand for), I would want my outfit to lend itself to someone thinking “Oh, yes, she’s one of those” – it would be rather ironic if it just conveyed the impression that I was another English Muslim convert! So I probably would go for a kapp, not a headscarf. There’s a small Mennonite church in London (I belonged to it before moving up North). You might like to check out the Amish Living site – it’s sponsored by publishers of Amish romances, but there’s a lot more to it than that, and some very thoughtful and earnest Christian women. you could also explore the Quaker universe of theology (it all started in England) and see if you fit in with any of their leadings and if you are lead to plain dress within them. yeah, there are plain quakers in the world, they are the minority, but they are out there (and in places like Ohio, but there might be some in England too). Thank you – will check this out. I used to like reading a still up website called “Quaker Jane”, although evidently “jane” isn’t plain anymore.. the site, if it is still up is a good resource, and has information toward Amish and Mennonite plain styling too. I have always thought it a remarkable irony that the Amish, who build their lives around a philosophy of humility and not drawing attention to the individual, have become so plain that they are now a tourist attraction. They may dress so plain that they’ve become a tourist attraction, but they’re just people. By this line of thinking some of the clothing of certain Mennonites seems more plain (read: less attention-getting) to me–plaids and denims for men, giving the appearance of a 1980s farmer style, and out of fashion dress patterns. Thanks, Erik, for pointing out that other thread. I happened to find it after I had posted on this one, and it was an interesting discussion. I don’t particularly have an opinion on whether the Amish should change their own definition of “plain.” It is more that I find myself uncomfortable with the tourism that has grown up around their plainness, and I wonder if they feel that it impinges on their own intent in living their particular way of life. I often feel that the Amish image is financially exploited by people who live around them. To be blunt, most of the tourist money in Indiana’s Amish country seems to be made not by Amish, but by Mennonites. I also wonder if the Amish lifestyle is treated as a curiosity rather than as a respected way of life by those who travel here to see it, almost as if it were a play being put on for their amusement. I realize it’s easy for me to say, “They’re just people; quit staring at them,” when I’m used to seeing them all the time, but sometimes, I find myself wanting to tell the tourists to just go home and look at each other, if they want to stare at people. As a Catholic, I have sometimes felt that way about non-Catholic tourists who come to gape at a cathedral, as if it were an art museum rather than a house of worship. I realize curiosity is often the entryway into deeper understanding of another culture, but that realization is at an intellectual level; my heart still feels very uncomfortable with it. I imagine that in some ways, the commercialization is even worse in Pennsylvania. I am from Amish Country, PA and a good place for you all to visit is The Amish Theatre, located in Lancaster PA! I was Amish until age 17 and still have hundreds (probably) of Amish relatives. However, I have never heard the question addressed as to when the Amish veered from mainstream clothing to what they wear now. When you think about it, what Amish women wear today is not that different from what rural ‘english’ women wore in the 1800s. I don’t think it was so much that the Amish and conservative Mennonites veered off as much as they just did not change with the prevailing mainstream fashions. Same reason that in the 20’s and 30’s Amish tourism was not so big; why travel to see folks driving horse-drawn wagons and dressing plain when most folks at home did pretty much the same thing. Mind you that I’ve never been there or seen any of this but my son, Mark, related to me that when he was in Alsace, France visiting friends; that they visited an Alsatian cultural museum in Strasboug, France. Mark related to me that he was just fascinated that the traditional Alsatian peasant costume styles were so much like the present Amish clothing patterns, especially for the women. Cape dresses. Prayer caps. Perhaps a little more frilly with lace and such but the basic patterns were very similar. Also, much of the antique Alsatian furniture, especially the big chests, were decorated with many of the designs attributed to the Amish but were common among the Alsatians too: distlefinks, linked hearts, etc. Has anybody else researched this? Interesting Don. I don’t have anything to add other than your comment reminded me of an early 1980s Bill Coleman photo of headwear among the Nebraska Amish women. When we posted it last year I included comments from John Hostetler in Amish Society who mentions these hats “resembl[ing] the Swiss and Alsatian peasant hats worn two centuries ago.” As far as I know, I don’t think you see this in other Amish groups outside of the Nebraska people. Well this is completely after the fact, but I have a small book somewhere with photos of now-unused, closed-up brick farm homes in Alsace, France, that belonged to some of the last Amish before they emigrated entirely to the United States. If I can find this book, I’ll post the name and author. Does anyone know what types of headcoverings women use while they sleep? I am a headcovering Christian who is not from a plain dressing denomination. I do not use an amish style kapp, I typically cover with a wide cloth headband or a scarf but I am hoping to start covering at night as well. Leave a reply to Why do the Amish wear Plain clothing?